Don’t miss your chance to visit with the man in red this holiday season! 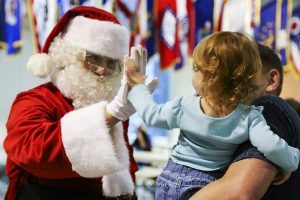 Here is a list of Santa visits in MOT and surrounding areas to help your planning! *Many of these events are photo-friendly, so be sure to take your camera to capture those special moments! *FREE* Chesapeake City, MD. Town Hall (corner of 2nd Street & Bohemia Ave). Saturdays & Sundays 12/2-12/23. 3-6 pm. *FREE* S. Main St. Kenton, DE 19955. Saturday, 12/9 – 6-8pm. *FREE* Downtown Dover. 101 W. Loockerman Street 1A, Dover, DE 19904. Saturdays Dec. 9th, 16th, & 23rd. 11am-3pm. *FREE* Rehoboth Boardwalk, Rehoboth Beach, Delaware 19971. Saturdays from 12/9-12/16: 3-5pm, Saturday 12/23: 11am-1pm, 1:15-3pm (pets only). Please Note: Santa’s House hours subject to change. *FREE* Odessa Fire Company. 304 Main St, Odessa, DE 19730. Sunday, 12/10: 8-11am. Delaware City Volunteer Fire Company No. 1, Inc. Station 15. 815 5th St, Delaware City, Delaware 19706. Sunday, 12/10: 9am-11:30am. Smyrna Police Department. 325 W. Glenwood Avenue. Smyrna, DE 19977. Tuesday, 12/12: 5pm-8pm. Dover AFB Fire Emergency Services. 140 Purple Heart Ave, Dover Air Force Base, Delaware 19902. Saturday, 12/16: 8am-11am. Saturday, 12/16: Breakfast with Santa: 8am-10am; Santa visits and crafts: 8am-11am.